The holidays are the season for giving and one thing we love to bring to parties is wine & champaign. With PackIt, you can arrive with a host(ess) gift that's chilled and ready to serve and an unforgettable bag that will be appreciated time and time again. We got one to review and we've found so many uses for it. It stays cold wonderfully long. And it's great the whole bag fits in the freezer, so there aren't separate pieces to track down on your way out the door. 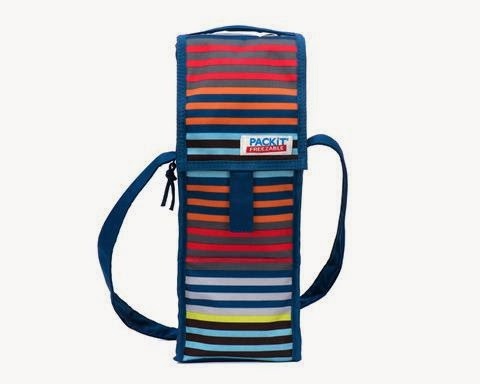 We've gotten compliments galore and lots of wishful glances at our PackIt Wine Bag. Disclosure: It's our pleasure to partner up with PackIt. They have provided us samples for our giveaway and for review purposes. As always, all opinions are our own. 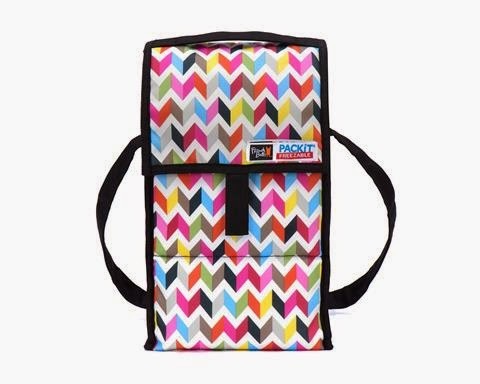 ENTER HERE for your chance to win a PackIt Freezable Wine Carrier Bag in single size, French Bull ziggy pattern ($14.99). Enter early and often through midnight 12/20. Open nationwide to anyone in the US. We've been featuring a string of hot toys and great kids' stuff, but why should the kids have all the giveaway fun? This one's for the over agers out there (unless you want to bring juice or other cold non-alcoholic drinks along to the party) and PackIt works great for those too! If the kids start to whine during the hectic holidays and the looooong winter break, a bit of wine for the grownups, in a colorful PackIt bag, will take the edge off and make your holidaze more merry and bright. I'm thinking PackIt party for the 21+ chaperones while the kids and the designated driver enjoy the skating rink and sled hill. And it's the perfect season for champaign or cold beer by a roaring bonfire. Order PackIt chiller bags today... for all your friends! Cool your vino to the perfect temp for hours at parties, BYOB dinners or picnics with this super smart wine tote. 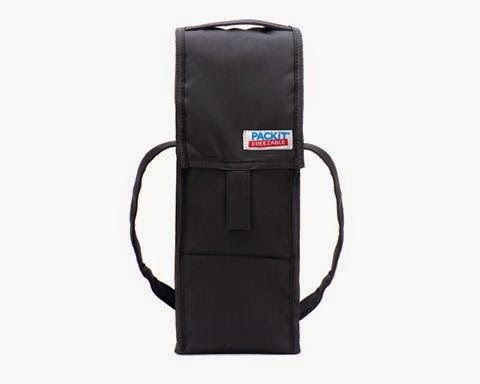 Toting PackIt's freezable wine carrier is like putting a wine fridge in the palm of your hand. It's the perfect travel cooler bag for any wine lover, whether you want to chill and protect wine and Champagne on a boat, at the beach or a BYOB dinner or just in front of the fire. 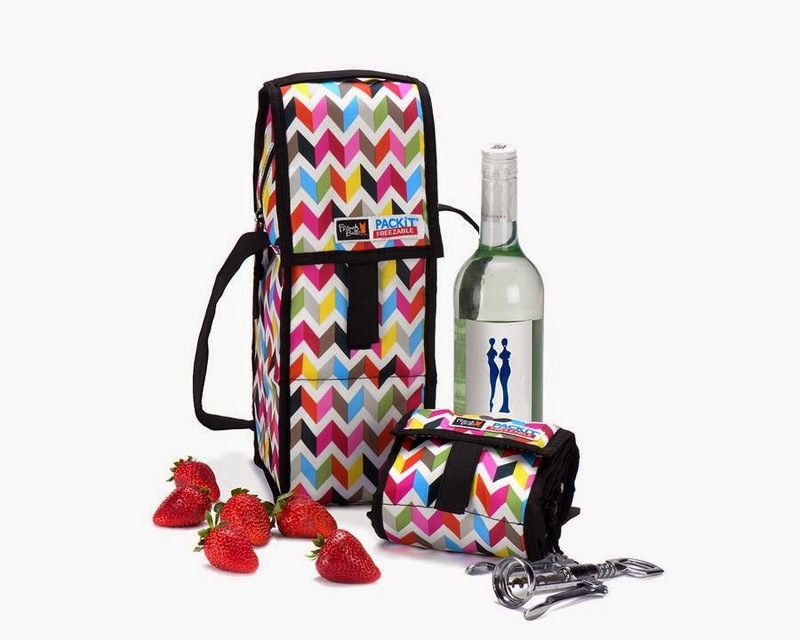 This insulated bottle bag with cooling technology chills wine up to 10 hours. Simply fold the cooler and store it in your freezer overnight. Pull it out and the walls of the bag are completely frozen. Insert wine, champagne or beer bomber and go. Each bag features a zip closure to lock in cool, dry air inside cooler tote and has a shoulder strap for easy carrying. The PackIt Wine cooler is available in single or double wine sizes and come in our French Bull ziggy, black or cali stripe patterns. They retails for $14.99 and $19.99 and can be found at www.packit.com. Follow us on ChiIL Mama's social media sites, like Twitter, Facebook Stream, ChiIL Mama's Facebook Page, Pinterest and Instagram Feeds for photo filled recaps, original content and FLASH GIVEAWAYS. Disclosure: Once again, it's our pleasure to partner up with PackIt. They have provided us samples for our giveaway and for review purposes. As always, all opinions are our own.